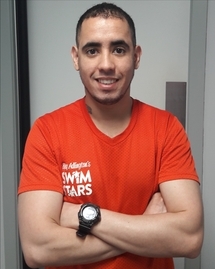 I really love swimming, and after being a lifeguard for 2 years I wanted a change of career and felt that becoming a swimming teacher was the right path for me. When I decided that it was something I definitely wanted to pursue, I searched for courses online and came across Becky Adlington Training. It looked amazing – especially because it was filled with Becky’s expertise and offered the opportunity to gain the swimming teacher qualification so quickly. What was your favourite thing about Becky Adlington Training? Honestly, I really enjoyed the whole experience from beginning to end and there were so many great things about it, I can’t pinpoint just one thing. But, what I thought was particularly brilliant was the amount of practical experience you get throughout the course – you get stuck in straight away and get teaching very quickly. I also made a lot of friends on the course and the classes were taught brilliantly - we had a lot of fun playing games, doing quizzes, which I thought just made the whole course really unique. It helped that my tutor was so supportive as well and supported us every step of the way. And of course, finding out at the end of the week that I had passed the course was definitely a big highlight! What skills have you developed as a swimming teacher? The most valuable skill I developed was my confidence. Before I started the course, I doubted myself so much I wasn’t sure I could even pass, but I gained so much confidence during the programme and after having been teaching for nearly a year now, it really has sky-rocketed. I feel so much more comfortable in myself and my people skills have improved so much! What’s the best thing about being a swimming teacher? It definitely has to be seeing how happy the children are when they turn up for their swimming lessons and how much fun they have while they’re learning to swim. Seeing them go from not being able to float by themselves, to laughing and playing in the water is such a rewarding feeling – especially because it’s such an important life skill too. Becky Adlington Training has been the best thing that I have done. It’s been such an incredible journey for me and I’ve learnt so much. It has given me so much drive, determination and confidence to believe in myself and I’m so happy I did the course. The qualification has really set me up for my future career.